In November 2010, Uli Hoeness announced at the annual general meeting of the FC Bayern Munich: ” In 2012 the Champions League finals will be held in Munich, and so we need to be there!” At that time, the “final dahoam” was an extremely ambitious long-term goal; now, nearly half an year later, the Bavarians are very close to the finals of the Champions League fighting for the highest title. The anticipation before the duel with Chelsea is similar in size to the gigantic pressure of the expectation. Both the team and fans are longing for the second Champions League triumph after the year 2001, and the forecasts are clearly for them to win in front of their home crowd. This also applies to the bookmakers, who see the hosts with a clear advantage to Chelsea. The distinct distance between the win rates has been surprising; after all, the Blues are anything but an easy opponent. The team of Roberto Matteo has shown to all the experts, who thought Lampard, Drogba and the rest have already reached their zenith and are now going down, to watch out better. The opposite is clearly the case, as in this season the old hands had a decisive role in winning the FA Cup, and also in reaching the Champions League finals. With the semi-finals victory over the FC Barcelona, the Brits put a real exclamation mark to their play. The highly favored Catalans were not in the position to crack the defensive bulwark in two games and deservedly withdrew at the end. The Blues have in recent years been frequently represented among the four best teams in Europe, but succeeded to reach the finals only once, in 2008. At that time, they lost on penalties to Manchester United. Now, four years later, perhaps have Cech, Drogba, Lampard and the other veterans their last chance to hold up the trophy. 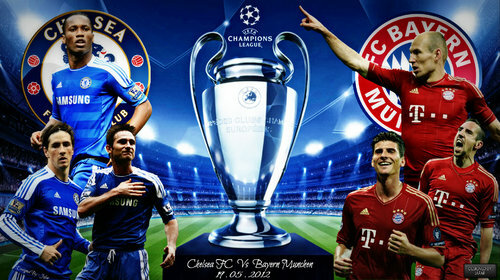 Now the Bavarians are facing an absolute all-or-nothing game. If the great coup succees, no one will talk about the failures in the championship and the cup any more. If they lose, this will mean the threat of a prolonged crisis at Sabener Street. Now, a few days before the game of the year, the Bavarians are trying not to emphasize on the recent Cup disappointment and erase it from their minds, and rather concentrate fully on the finals. Internally, we can certainly say more than one word on the underground defensive performance in the Cup’s finals. Similar mistakes must not be repeated against the Chelsea team, otherwise the expected magical night will be turninginto a nightmare.